Vegas Strip Blackjack is played with six decks of 52 cards. The decks are shuffled after each hand. The general rules for blackjack apply to this game as well. The rules which are specifically different are described below. The dealer stands on totals of 17. If the dealer's face up card is an ace, the player is first offered insurance and then the dealer checks for blackjack. If the dealer's face up card is a 10 value card, then the dealer checks for blackjack directly. If the dealer has a blackjack then he wins immediately. The rules for 'splitting' are as follows. 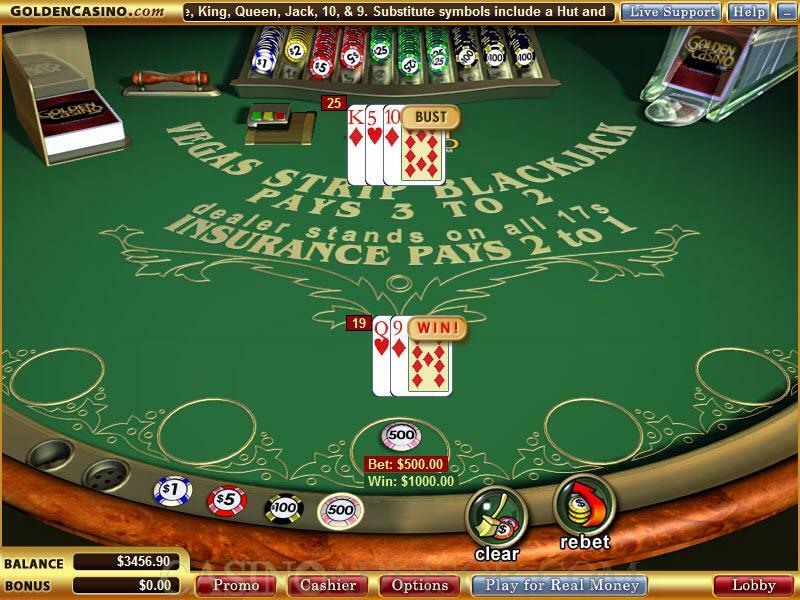 Re-splitting is allowed twice, except that aces cannot be re-split. A hand consisting of an ace and at 10 value card obtained after splitting aces is not considered as blackjack but a normal hand with value 21. It loses to the dealer's blackjack and if it wins the payout is for a normal hand and not a blackjack. The rules for 'doubling' are as follows. 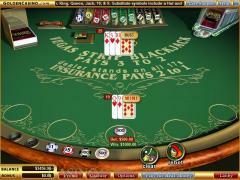 Players can double hands which have been split except in the case of split aces. The rules for 'insurance' are as follows. Players who split after purchasing insurance lose their insurance. The payouts for Vegas Strip Blackjack are as follows. Player wins are paid out at even money. Player blackjack wins are paid out at 3:2. Player insurance wins are paid out at 2:1. Ties push and the players are returned their wager.